As one of the world’s most iconic Natural Wonders, travellers flock to Victoria Falls to experience the majestic waterfalls and a range of thrilling water, land and sky adventures which are available only on the Zambian side of the Falls, with guests of The Royal Livingstone Victoria Falls Zambia Hotel by Anantara benefitting from highly exclusive experiences. The Royal Livingstone Hotel by Anantara and neighbouring AVANI Victoria Falls Resort are the only hotels on the Zambian side of the Falls to offer luxury water taxi arrival transfers along the Zambezi River, treating travellers to exceptional photographic opportunities, even before the real adventures begin. A daring highlight of visiting Victoria Falls is swimming in Devil’s Pool. This uniquely located plunge pool resides right on the edge of the Falls, where the thundering cascade plummets 350- feet, providing a pulse-racing dip for those brave enough to venture into the Zambezi River. The pool is also special in that it can only be accessed between mid-August and mid-January, before the summer rains swell the river. Afterwards, the pool remains hidden and off limits under the river’s pounding flow. Wildlife river safaris promise excellent game and bird viewing. Specially designed safari boats have the unique ability of traversing the rapids safely and comfortably, and can even cruise in water as shallow as 200 mm. The rushing rapids of the Batoka Gorge offer the heart-pumping thrills of white water rafting and jet boating, expertly navigated by experienced river guides. An adventure flight in a Huey helicopter, flown with doors open at a lower level, skims over the African bush, deep down into the dramatic Batoka Gorge and over the Falls. Even when the river levels are low, this memorable experience has soaring wow factor. 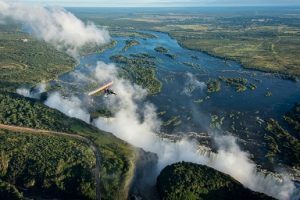 For those seeking a different type of flying adventure, the spray of the Falls’ can be felt while soaring over its splendour in a microlight, which flies above the Victoria Falls and continues upstream over Long Island, Palm Island, Kakunka and Kandahar Islands and finally onto the Mosi-oa-Tunya National Park for a genuine bird’s eye view of the awesome spectacle. The Royal Livingstone Hotel by Anantara offers guests unlimited complimentary access to Victoria Falls, boasting an incredible location just a 10-minute walk away with its own private entrance – allowing guests to return time and time again to marvel at ‘The Smoke that Thunders’, which throws a cloud-like spray across the bush and creates rainbows that rise hundreds of feet into the air. Equestrian enthusiasts can head off on a horseback safari alongside the Zambezi and through the surrounding forest to catch close up glimpses of African wildlife. 4×4 safari drives explore a heartland of broad plains and wilderness, with seasoned guides heading to prime spots to track a diverse range of free-roaming animals, including the mighty Big Five of lions, elephants, rhinos, buffalos and leopards. A full-day outing into nearby Chobe National Park is a must-do for animal lovers. Winding down after adventures, sunset cocktails at The Royal Livingstone Hotel by Anantara are spectacular on The Sundecks, providing a prime viewing spot to enjoy the wondrous Victoria Falls, whilst at the same time, the local wildlife including zebra and impala are out and about enjoying the grounds of the hotel, making the most of the magical twilight.